Bruner’s quote aptly sums up the importance of transfer: the ability to use what we’ve learned in a future context or situation. Otherwise, what’s the point of all those years of formal schooling? Most teachers would probably agree with Bruner and hope that their students will retain and use the knowledge, skills and habits from each course. The reality is that numerous studies have found that the majority of assessments do not measure beyond the ability to remember or recall in specific ways. Importantly, the thinking demands of remembering and recalling do not readily facilitate transfer to new situations. 1) Aim for assessing higher-ordered thinking beyond recall and remembering. Susan Brookhart, assessment specialist and author of numerous publications says, “…many teachers believe they are assessing higher-order thinking when, in fact, they are not.” Her advice? Present something for students to think about, usually in the form of introductory text, visuals, scenarios, resource material, or problems of some sort. Distinguish between level of difficulty (easy versus hard) and level of thinking (lower-order thinking or recall versus higher-order thinking), and control for each separately. Don’t be afraid to put definitions and other resources on the assessment. If your aim is not to have them recall it but to use it, then by all means give it to them. 2) Use novel or new situations or examples that you have not used in class. This is essential if you want to be sure students are not just recalling your (or the books’, or classmates’) analysis, evaluation, etc. This seems to be a very hard habit for teachers to break. Here’s a quick example from a unit on the Great Depression. The teacher wants to see if students understand key terms. So she can’t use examples from the Great Depression! She needs new ones. 3. Find ways to make the assessments contribute value beyond the school. This is the definition of authentic. Instead of the same old essay prompts written only for the teacher’s eyes, make the prompt that will end up as letters to government officials. Partner with businesses and non-profits to make public awareness campaigns or recommendations. The simplest is for students to submit written work using online platforms. If students know it has real-world value they’ll work harder on it. If you’re low-tech you can literally have students work on a separate piece of paper then fold it up and put it in an envelope to send to a real audience. 4. 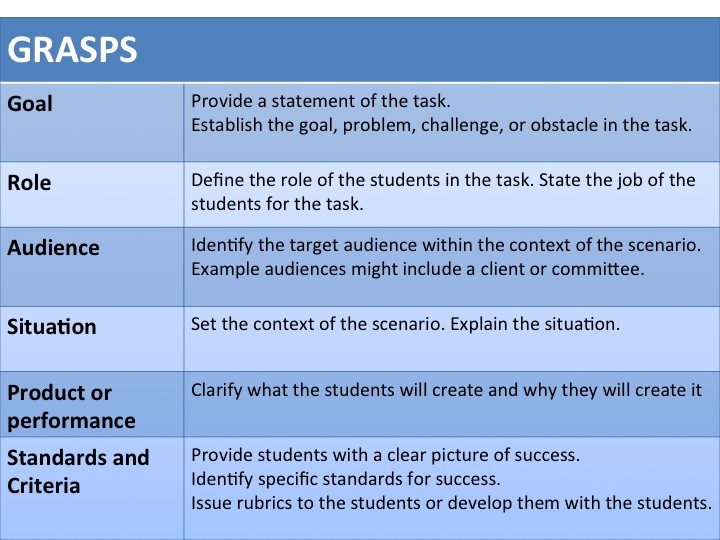 Use Wiggins and McTighe’s GRASP model to help you formulate the task. 5. Assess concepts and conceptual relationships that transfer to new situations. If you’ve been studying the concepts of symmetry and proportionality, simply ask students: What is the relationship between symmetry and proportionality? Ask them to use the S-E-E-I model: State the relationship in one sentence, Elaborate (In other words…), Exemplify (For example…), and Illustrate (provide a drawing or analogy). Then provide a novel scenario in which students can apply and test this relationship. 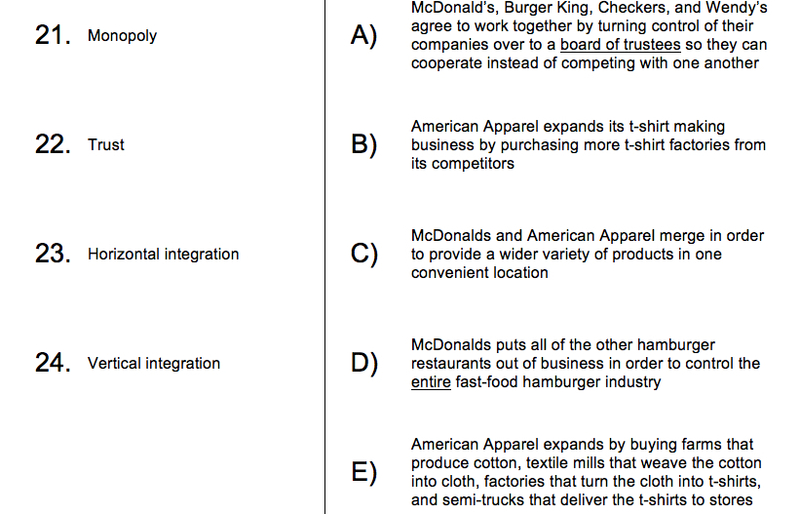 In the weeks leading up to a new unit, we scan the New York times for our concepts at play. We think of examples where the relationship between the concepts is clear, and when it is more complicated. For instance, if students have been studying the relationship between order and security, they may have come to the conclusion that high degrees of order in society – obedience to established laws, mechanisms for enforcing rules – produce higher degrees of security – the expectation that one will not be harmed in his life or property. However, as part of an assessment we might ask students to watch a short documentary about totalitarian rule in North Korea and to write a blog post applying their understanding of order and security to this new situation. Dealing with the complications of this scenario would force students to stretch their understanding and truly prove their ability to transfer. 6. Ask students to evaluate their thinking on the assessment and think of ways to improve it (aka Critical Thinking). Check out these posts for ideas and use this rubric to measure it. 7. Make a blueprint so you are precise about exactly what you are measuring before you create the exam and the learning experiences to prepare students for it. I can’t believe I got a Master’s in Education from a reputable school without exposure to the revised Bloom’s taxonomy. What is the brain doing when it analyzes? What does it really mean and look like to explain? If I ask students to create a poster, is that really the highest level of thinking? Even if you don’t order the book, download this and use it every time you write an assessment. We’ve synthesized these 7 tools into this handy sample blueprint template in the hope it will help you to get started. Let us know what you think. If you like these ideas, check out our free resources page, our elementary and secondary books and our game-changing workshop in DC this summer or Wisdom in Education Summit in Melbourne in May!